For centuries Jews have been persecuted and murdered because that Jews ritually murder children and eat them directly or use their blood in the baking of Passover matzah (unleavened bread). Today such myths spread about Muslims too: the myth that Islam allows cannibalism. When doing comparative studies of anti-Semitism and Islamophobia one can easily see the similarities between the two. The myths, slanders, rumours, and racist methods are almost identical but is directed against two different groups, Muslims or Jews. Today these myths are still heard all over the world about Jews. 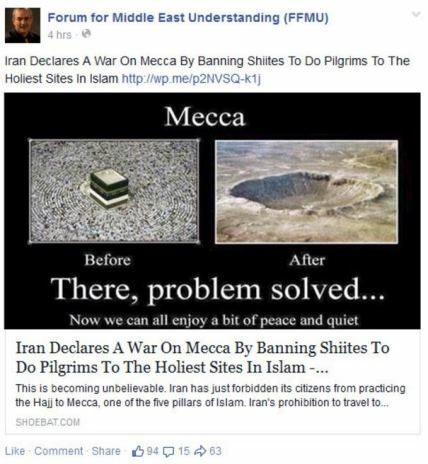 But there is an Islamophobic version of the myth too. “Muslims eat Christians”. That kind of myth was spread during the crusades in the Middle Ages. Today it is sometimes still claimed that “Islam allows cannibalism”. I will spare the readers the details of the Myth. If you want to study what racists claim about Islam and cannibalism you can easily find articles from Jihadwatch and Pamela Geller on the subject by using Google. “In the future, the Egyptian Islamists will not only be conducting systematic violence, but cannibalism against Christians and moderates. From this TV-interview, that Shoebat popularized, stems most versions of the modern Muslim blood-libel myth. But currently the myth is mixed with similar allegations about ISIS. That “Muslims allow cannibalism” and the proof for that is that ISIS allow cannibalism (and sometimes it is claimed that the Al Azhar university authorized ISIS to eat its enemies). Perhaps such a book exist, I dont know. The myth is nevertheless a typical racist myth. 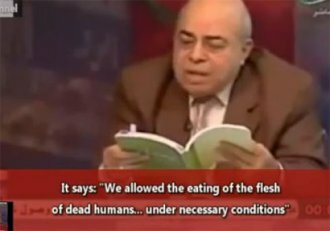 One or two alleged books allegedly published by one Egyptian university somehow is the “proof” that all Muslims, and all of Islam, allows cannibalism. As for Shoebat himself he does not seem to be a cannibal, he prefers to nuke people.